New ACCEPT Concert Report and Gallery Pics! I have lived here in Finland for about three and a half years, being transplanted from Tennessee into a heavy metal wonderland. In this span of time, I have had great opportunities to cover bands I could only dream of back in my home state. One of these great opportunities has been getting the chance of covering the legendary ACCEPT. To say I was eager is an understatement. The band took the stage as the day had mostly faded away but with glimmers of light peeking through the clouds; a norm for long Summer nights in Finland. This night, though, the people of Kuopio needed to beware of what was lurking in the shadows because they were in danger of getting stampeded by a heavy metal titan. 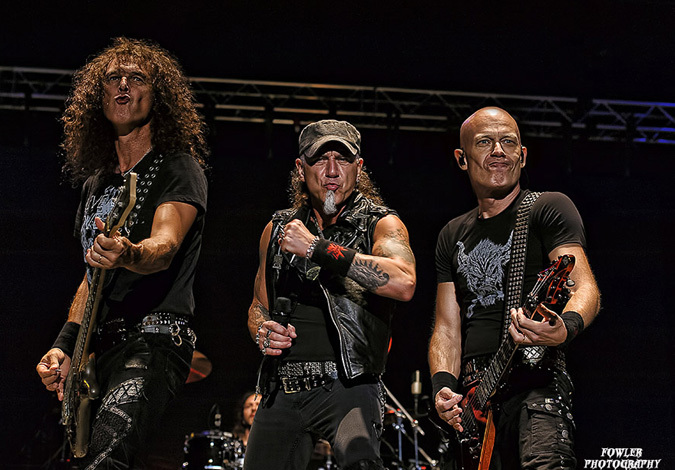 ACCEPT stormed the stage and proceeded to stampede the audience with…well the song Stampede. The fans went ballistic and cheered the band every step of the way and the band kept rolling its metal wheels and launched into Stalingrad followed by London Leather Boys. One after the other, the band kept delivering hit after hit and the fans screamed in unison with the band. Whether it was Princess of the Dawn, Metal Heart or newer songs like Pandemic and Teutonic Terror, the Finnish fans made their country proud this night and gave the band 110% support. Even the fans off to the side in the drinking areas and not in the main crowd area were standing and headbanging to the band. The city of Kuopio itself showed its pride. There were several police officers who actually came to the festival when ACCEPT went on stage to specifically see the band play because they were fans of the band.